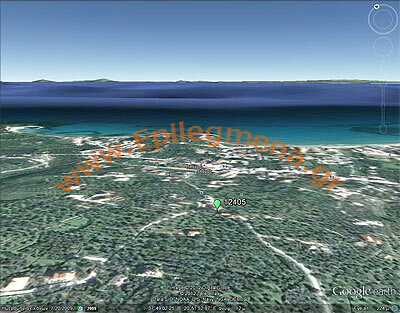 PROPERTY DESCRIPTION: PLANOS-TSILIVI BEACH, on the eastern part of the island. 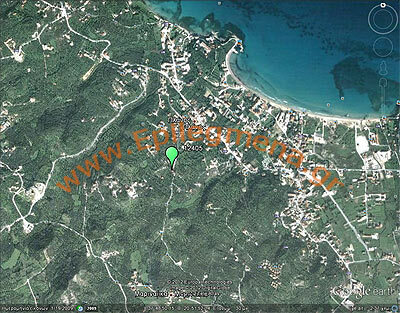 Plot of land 1.041m2, in walking distance (750m) from the famous beach, drowned in vegetation. Ζͺ construct one or more residences, totaling 400ϊ2, in two levels and roof. One of Lord Byrons favorite Greek islands, Zakynthos is 8.5 nautical miles south of Kefallonia. The Venetians called it "the flower of the east" and they occupied Zante long enough to smell the flowers and more. Many of the islanders have Venetian blood. Tourism has made incursions on Zakynthos but nowhere near as badly as some Cycladic islands. Endanged species, such as the loggerhead turtle have not fared so well contrary to Greek and EU law. Turtles come from all over the Mediterranean to lay their 100 to 120 golfball-sized eggs in the sands and are suffering because of toursim and unrestricted development. Zante or Zakynthos has much to recommend it, especially away from the main touristic areas of its southern shores. The island has exceptional natural beauty and outstanding beaches. Beaches in the north are the least affected by tourism. The islands' west coast is cliff-like while the east has rolling hills and flatter terrain. Zakynthos Town, its capital and main port was destroyed by an earthquake in 1953. It was rebuilt along the same lines, and retains much of its charm. In the Bay of Laganas, on the south coast, loggerhead turtles lay their eggs. The island villages of Maherado and Aghios Nicolaou have escaped the changes of tourism and are set in lovely country. Zakynthos Town is the capital and port. The center of town is the large and formal harborside square of Platea Solomou named after Zakynthos' famous poet and author of the Greek National Anthem, Dionysios Solomos. You'll see his statue waving at you in the square as well as the statue of fellow poet and Zantiote Ugo Foscolo with its inscription 'Liberty requires Virtue & Daring' just outside the Town Hall. Also in the square is the Cultural Center and the Sailor's Church, Aghio Nicolaou tou Molou (of the Mole, ie. quay). The church was rebuilt painstakingly after the quake. The Neo-Byzantine Museum also resides in the square (8-2:30, closed Mon, fee, free on Sun). The Museum is one of the best of its kind as Zakynthos had many fine artists and the refugees from Crete only added to their skills. Additionally, there are ancient finds from around the island and momentoes from the War for Independence. The social center of town life is Platea Aghious Markou or St. Marks Square. It's located back from the harbor. Here are several good restaurants, cafes and the Solomos Museum with momentoes of his life as well as those of other famous islanders. You can see pictures of pre-quake Zakynthos. A 45 minute walk up the cobbled path behind Platea Markou (or a short taxi ride from town) through the picturesque suburb of Bochali will bring you to the ruined Venetian Fortress (8-8, fee) with its crest of St. Mark, set amidst pine trees. Completed in 1646 on the site of the ancient Acropolis of Psophidas (of which little remains) it has borne the brunt of earthquke damage. Nearby are ruins of midieval Venetian, Greek and British villas. Repairs were carried out in 1812 by the British who laid out the very first tennis court in Greece close by. Argassi just to the east of the port (# 4 on map) is the closest large tourist beach with big hotels and several tavernas. Further east along the peninsula are better choices among which are Porto Zoro and Banana Beach which is strewn with sea daffodils and exudes a strong flowery fragrance. Agh. Nikolaos, Mavrandzi and Porto Roma follow and all have some facilites. The peninsula ends with the best beach Gerakas(#16). Loggerhead turtles frequent this beach, so water sports are curtailed. To the south of Greakas are two secluded, undeveloped beaches Daphni and Sekaniki, also popluar with the turtles. Kalamaki Beach (#7), just south of the airport is the beginning of the over development of Zakynthos. The longest beach on the island, extending for five miles, it is one of the longest in Greece and a major breeding ground of the Loggerhead turtle. These turtles are one of the oldest species on the planet and go back hundreds of millions of years. Because the prevailing winds nearly always blow towards the sea, and the flying restrictions imposed because of the turtles, there is little noticeable distraction caused by aircraft noise. For another quiet beach try pine shaded Aghios Sostis islet at the southwest end of the bay. It's reachable by bridge. Laganas (#10, or the mistakenly called rabbit beach in Greek) is the next big beach and also the prime nesting ground for the loggerheads (Caretta caretta) and usually has every summer, from June to September, over 1000 nests on its four km of beach. Turtles come from all over the Mediterranean to lay their 100 to 120 golfball-sized eggs in the golden sands around the Bay of Laganas where they incubate for 60 days. When the eggs hatch the baby turtles emerge and make a break for the open waters, they are sometimes distracted by the lights from the tourist enclave and expire from exhaustion. It is of the utmost importance that, in order to ensure their survival, the beach is avoided between dusk and dawn, that no umbrellas are stuck into the sand and that no vehicles are driven over the sand. Departing Lithakia north the road passes over the earthqauke created Avyssos Gorge and coastal swap of Limni Keriou where the natural pitch once used to caulk boats existed in great quantities. There are a few beaches such as Keri (#25) a small village at the end of the peninsula with a pebble beach, some amenities, inexpensive rooms and nice views. From Keri boat excursions may take you along the southern shores to view some spectacular scenery and the two natural arches at Marathia. The road continues north to Volimes, the west coast's largest village and a center of handicraft woven goods. Upper Volimes perches above on the cliffs. There's a lookout platform, not for those with vertigo, that looks out over the Shipwreck Beach. The coast roads heads north from Zakynthos Town passing the Kryoneri Fountain built by the Venetians to water their currant and wine laden ships. Shortly it turns west and several nice and less developed beaches are available: Tsilivi, Pianos, Tragaki, Ampoula, Pachiammos, Drossia, Pasarou, Ammoudi, Alikanas and finally breezy Alikies, which is popular with windsurfers. Further to North is another group of beautiful beaches such as Makri Alou and Makri Gialo. Just past is the Port of Aghio Nokolaos and where you can board ferries to Kefallonia. This is a lovely area with many strange natural rock formations and caves the most notable of which is the Blue Grotto or Kianoun Cave almost at the nothern tip of the island. it is directly under the lighthouse on Cape Skinari. It's known for it stunning clear blue water. You can catch a boat for the Grotto at Agios Nikolaos. The famous and oft-photographed Shipwreck Beach is at the northwest tip of the island. The area can be very crowded when the cruise ships off load hundreds of visitors at a time. Get a small boat and visit the beach and the Blue Caves on the northeast in the same excursion. Try the local nougat sweet, mandolato. The choices here range from traditional Greek fare to international cuisine of various sorts. Most eateries are in Aakynthos Town, Tsilivi and Ag. Nikolaos. "I recognize you by the fierce edge of your sword; I recognize you by the look that measures the earth..." - Ode to Liberty - the opening stanza of the Greek National Anthem - which Dionysios Solomou of Zakynthos composed upon hearing of Lord Byron's death. Like so many Greek islands, Zakynthos has had a succession of rulers: Athenians, Spartans, Macedonians, Romans, Byzantines, Venetians. Since 1864, Zakynthos has been a part of Greece. There is bus service on the island. You can rent mopeds and scooters.